Welcome to Bidhannagar College, a purely Government Establishment since 1984. 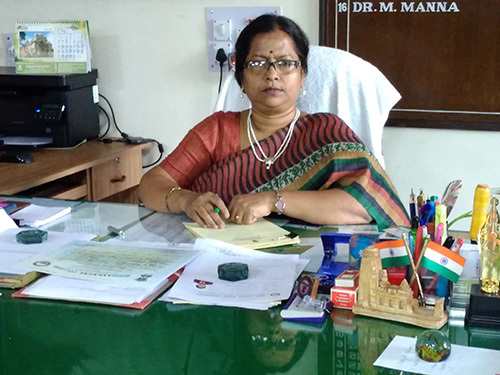 It is among the best of the colleges affiliated to the West Bengal State University and is better than most of the colleges under any university in the state of West Bengal, given the diversity of subjects taught and the vibrant modes of learning adopted by the students under the guidance of inspiring teachers / professors. The prospect of new teachers joining the College, especially at every turn of planned development, which the College has just reasons to boast of, adds variety, expertise and commitment to the respective Departments in particular and to the College in general. Of the sixteen Departments, three offer PG Courses –three more likely to be added, subject to final inspection, to the existing three: Anthropology, Botany and Education in addition to Chemistry, Microbiology and Zoology. Still, there are new initiatives in the offing. With no space-crunch, no intellectual potentiality-crunch and no lack of initiative, the College is rich in multi-faceted infrastructure –smart class rooms, regularly enriched laboratories, museums, upgraded gymnasium, to name only a few. All we need is an influx of intelligent and sincere students, who are ready to co-operate with the teachers to get engaged in a vibrant, interactive, teaching-learning process as well as in the co-curricular activities designed for adjustment, tolerance, socialization –an all-round development. All intelligent and sincere students stand a good chance here for seeking a future. For the students, financial support is there: support from KanyashreePrakalpa, SC/ST/OBC scholarships, Indira Gandhi Single-Girl-Child Scholarship, the Chief Minister’s Relief Fund, National Scholarships for Minority, Rajiv Gandhi National Fellowship for SC/ST students, Jawaharlal Nehru Memorial Fellowship and the like for the UG, the PG and the Research Scholars. For the expansion and development of the College, support comes from the Government in multiple ways under multiple heads. The Government Development Grant exclusive of UGC, DST, WBDST and MoFP deserves special mention here. The story of a student here does not begin and end here with his / her entry and exit; it continues in a most significant way. A cloud database is under construction right now, putting on record every important detail of the students’ progression –their present details and their future needs and support. They stand ever related to the College, no matter whether their participation as in some significant event or development programme is auto-inspired or implored by the alumni community and / or their respective Departments. Bidhannagar College does all it can to develop a sense of belonging, which is so important for any community –a community made up of the students, the ex-students, the teachers, the teaching associates and above all the Principal. Success consists in cohesion; happiness, in success and intellectual prospect.